Hong Kong is served by just one airport and it's conveniently located close to the city, so getting from the airport to your hotel is super easy. If you're flying into HKG (Hong Kong International Airport) there are three options to get into the city: train, bus, and taxi cab. Most people opt for the train because it's fairly quick and cost effective, however if you travel with a ton of luggage you may want to opt for a bus or taxi. Here's a quick guide on your three options from HKG airport into Hong Kong, along with trip duration and prices point. The Airport Express is the Hong Kong’s rail connection to the city. It’s fast, comfortable, and takes only 24 minutes to get to Hong Kong Station. 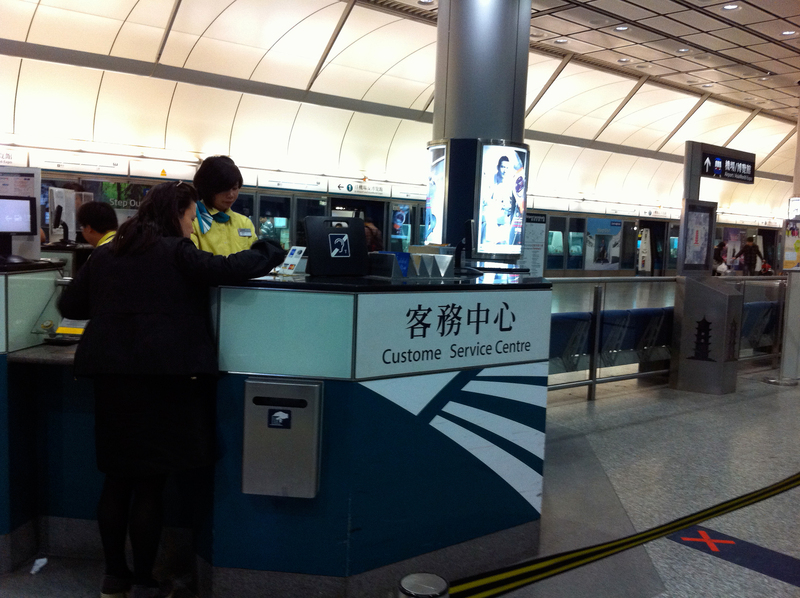 Tickets are available at any of the Airport Express customer service counters, located in each of the terminals. The cost is HK$100 one-way or HK$180 round-trip, including a transfer to the MTR subway. Efficient or what? Couples traveling together can get a one-way ticket together for HK$160, so if you're traveling with a partner make sure to request that fare. The Airport Express runs from 6 am- 12:49 am trains depart every 10-12 minutes. Looking for a cheaper entry to the city? Hong Kong’s bus system is the preferred method of travel for the price conscious traveler. There’s about a gazillion routes, but the most popular (and likely relevant to you) are the route A21 and the A11. The A21 will take you to central Kowloon in about 45-50 minutes, and costs about HK$33. The A11 goes to Hong Kong Island in about 60-70 minutes, and costs HK$40. The buses make multiple stops along each route, including several major subway stops if you need a connection point. There are a number of overnight bus routes that will get you from Hong Kong to HKG airport if you've got a ridiculously early flight. To find the bus stop closest to where you're staying check the schedule on the Hong Kong Airport Website. Taxis in Hong Kong are surprisingly affordable, and depending on your destination and time of travel, might be a faster way to get to the door of your hotel. Obviously if you've got a lot of luggage this option will be appealing to you. There is a taxi stand in each terminal, you are looking for the urban taxis which are red. These red taxis are the ones that service Kowloon, and Hong Kong Island, while the green and blue taxis serve the New Territories and Lantau respectively. The fare to Kowloon varies from HK$210-275, and Hong Kong Island will run you from HK$280-345. Up to 4 people can travel in a taxi, and a baggage charge is discretionary, but usually minimal — around HK$5 per piece. All in all, if you're in a rush, have a ton of luggage, or are traveling with a group of more than 2 people, a taxi into city center is a smart choice. Most red taxi's run 24 hours a day, and there are almost always a line up outside the airport ready to take you where you need to go.